As I mentioned somewhere else on this blog, the American horror movie landscape was pretty unique in the late 50s and early 60s. American companies weren’t convinced that traditional, gothic or literary horror pictures could really grab the youth market until Hammer and later American International proved that with their Draculas, Frankensteins and Edgar Allen Poes. In the meantime, any American horror movies made were set in the present day and any connection they had to classic monsters was superficial at best. Take for instance this movie I am currently reviewing. Frankenstein’s Daughter is no more a Frankenstein movie than any other movie about a mad scientist who experiments on bodies to create life. And quite honestly Frankenstein’s Daughter is a pretty misleading title; the mad doctor’s creation is a female (and barely at that) but the doctor is actually Frankenstein’s heir so shouldn’t it be called Frankenstein’s Great Grandson? I guess it doesn’t have the same ring to it. But what’s really great and surprising is how grotesque the movie is for 1958; the scene where the doctor gets a burning chemical thrown in his face could easily earn an “R” rating these days. The makeup job on the monster is no slouch either. 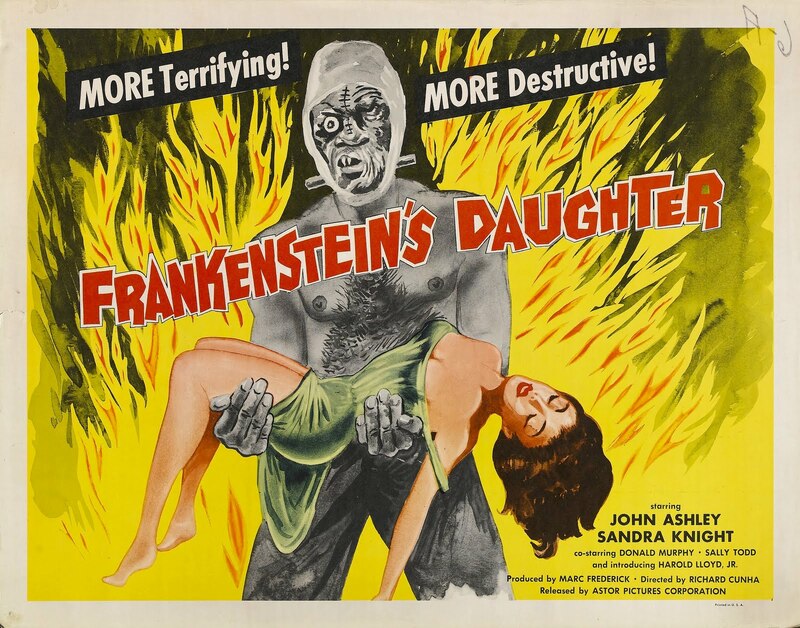 Frankenstein’s Daughter concerns a mad doctor named Oliver Frankenstein (Donald Murphy) who assists an elderly scientist named Carter Morton (Felix Locher), who is experimenting to create the cure for every disease ever (hey, I didn’t say it was a good script!). Frankenstein has other plans; to use the laboratory and its resources for his own demented plans to bring the dead to life. He also has a creepy assistant named Elsu (Wolfe Barzel), who helps round up corpses for the experiments. Since this is a “modern” horror picture, the protagonists are all teenagers or, rather, people in the their 20s/30s acting like teenagers. The main one, Trudy (Sandra Knight) is also the niece of Carter and nightly transforms into a hideous monster that attacks people. Surprise surprise, this occurs when the maniacal Oliver Frankenstein spikes her drink. But that’s only a sub plot. The main plot concerns the doctor collecting bodies and eventually assembling his monster. The monster rampages and does the evil bidding of the doctor and that about covers it. It doesn’t sound like the most original plot in the world and it’s not. But it’s fun because the doctor is such a nut job who even makes time to paw after the two female characters between his mad exploits and the monster makeup is awesome. Kills? Not enough but one of them has the doctor run down a victim with his car. Also, in order to further exploit the youth market of the time, there are a handful of rockin’ musical numbers performed by the Page Cavanaugh Trio.